Glass is the third movie in the M. Night Shyamalan trilogy containing Unbreakable, Split and Glass. In the first movie, Unbreakable, M. Night Shyamalan, created a world where superheroes do not exist, a world similar to our own where superheroes only live in comics, movies and dreams. Unbreakable follows David Dunn played by Bruce Willis as he is being convinced that he is a superhero by Elijah Prince (AKA Mr. Glass) played by Samuel L Jackson. David Dunn comes to believe he is a superhero and imprisons Mr. Glass for mass murder. The second movie in the trilogy is Split, which follows Casey Cook, played by Anya Taylor-Joy, a young girl who was kidnapped with her two friends by Kevin Crumb, played by James McAvoy, who suffers from dissociative identity disorder and has 24 personalities. One of Kevin’s personalities is the “beast” that is stronger and faster than a human and can climb flat walls in an inhuman way. Both of these movies have come together for a clash of a superhero versus a supervillain in a world where neither are supposed to exist. These movies were made in almost a span of 20 years, and now the final showdown is happening between the beast and David Dunn, while Mr. Glass the mastermind plays puppet master. This film is a superhero movie like none other. A superhero movie where superheroes aren’t real is something I have never seen before, and this movie develops both its characters and its plot in amazing ways, with twists waiting around every corner. It keeps your interest through both the slow and intense parts. The actors and actresses in this movie are extremely talented, specifically James McAvoy. 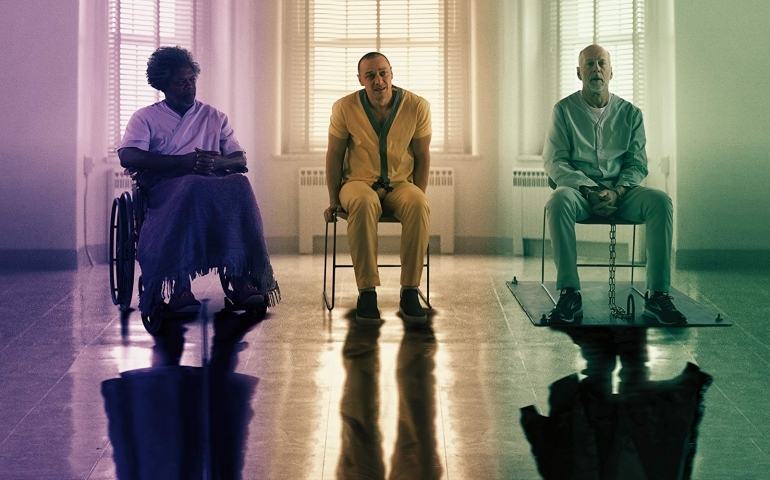 In Glass, we see more of the 24 personalities than we saw in Split, and watching James McAvoy transition through each of them is fascinating. When he changes personalities, you can tell the difference between the 24, and he is so consistent that as soon as they start talking, you know exactly who it is. It is truly astounding to watch. Without a doubt, this movie stands out from the typical superhero movie and is astounding. Whether you like superhero movies or if you hate them, this movie is worth watching. Be sure to watch Unbreakable and Split to enjoy the entirety of the series!